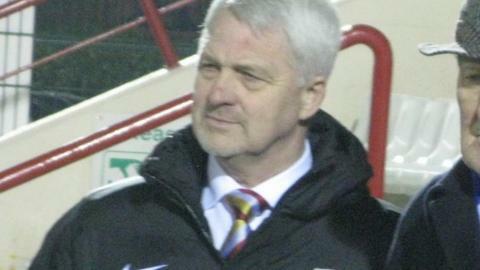 Former Aston Villa and Leicester City boss Brian Little has been tipped to become Jersey's new manager. Ex-Jersey boss Craig Culkin says Little should take over from Jimmy Reilly, who resigned earlier this month. The 62-year-old was named Jersey's director of football in October 2014. "I certainly see the job being given to Brian Little, he applied for it when Jimmy did," said Culkin, who quit after a dispute with the Jersey FA over player selection. Little led Aston Villa to victory in the 1996 League Cup, two years after guiding Leicester City into the Premier League via the play-offs in 1994. He would not be the first high-profile manager to take charge of the Jersey side; former Chelsea captain Ron 'Chopper' Harris was appointed in 2001 and steered the team to victory over Guernsey in the Muratti the following year. "Brian's on the island two or three days a month, he'll get an opportunity to work with the players when he's over and I'm sure the lads on the ground will be keen to work with someone like Brian Little and learn from him," Culkin told BBC Radio Jersey..
"I'm sure it would give the players a lift, some enthusiasm and desire to go training and want to play for Jersey." Last month, Jersey announced an intention to make a bid to join Uefa and play international football, but despite that prospect, Culkin says he will not be applying for the role. "I don't think the Jersey FA would want someone with a personality and ambition like mine back in the role. I say it how it is," he added. "I'm strong in my convictions, I've worked hard in my career professionally and personally to get where I am and sometimes when I believe things are not done right or against my morals and my ethics I have something to say. "I felt I was unfairly treated in my time there, but the Jersey FA have moved on and so have I."